Take Home the Furniture You Need for Holiday Entertaining Today! Whatever furniture you need to get ready for Holiday Entertaining, Cornerstone has you covered. Pictured here is a Great Looking Game Table Set that is sure to add some fun to the party. It just arrived yesterday along with more Dining Room, Living Room and Occasional furniture. So, whether you need just a few extra dining chairs, or an entire Dining Room Set, Cornerstone is ready to help. Also pictured is just a part of our Huge Dining Room Selection. 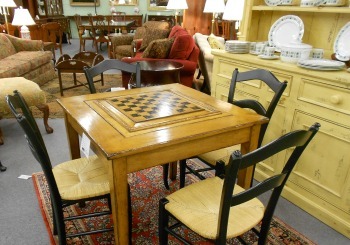 We’ve got tables, sideboards, china cabinets and more. All of our “like new” furniture is prepped and polished by our workshop staff and Ready to be Taken Home Today! 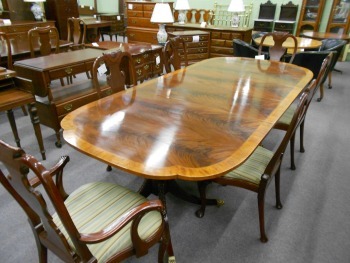 Kindel Banded Dining Room Table, Stickley and Maitland Smith Shieldback Chairs and More! 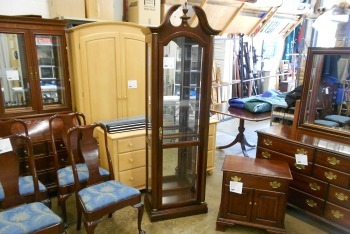 Baltimore’s Favorite Consignment Store has Traditional Cherry and Mahogany Furniture Arriving Daily! Which means it’s not to late to have your home looking great for Holiday Entertaining. The Kindel Mahogany Inlaid Dining Room Table in the middle of this picture just arrived this week and is sure to find a new home soon. Whether you prefer Chippendale, Hepplewhite or Queen Anne Chairs, Cornerstone has you covered with a Fabulous Selection of Pre-Owned, Consignment Furniture Selling at Just a Fraction of It’s Original Cost! Also pictured is just one of many desks we currently have in stock. While many people are thinking of Dining Room this time of year, don’t miss the chance to choose from one of the Biggest Selections of Home Office Furniture and Executive Desks that we’ve had in a long, long time. And remember, while we picture every piece of Showroom Furniture on our website, we always have a large selection of pieces waiting on our Dock and Preview Room that haven’t been photoed for the site yet. 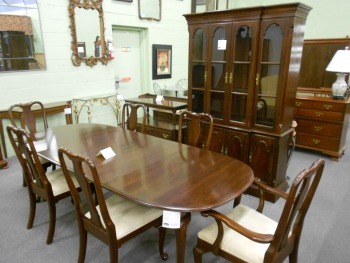 So, It’s Always Worth the Trip to Timonium to See the Area’s Largest and Best Selection of Consignment Furniture! 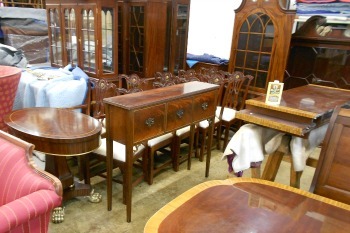 Mahogany and Cherry Traditional Dining Room Furniture Arriving Daily!! As we welcome in November, we’re reminded that it won’t be long before the guests start arriving to celebrate Holiday meals with us. Fortunately, there’s a way to get your Dining Room Looking Great without taking out a home equity loan! Pictured here are Dining Room Sets from two great makers- Baker Furniture and Ethan Allen. These two sets are just making their way out on the floor and haven’t even been photoed for the inventory section of our website yet. A visit to our store today will get you the first look. If you miss these sets, don’t worry, our truck is scheduled to pick up some Beautiful Inlaid Mahogany Sets next week as well. So, don’t think you’ve waited to long to get your home looking great for the Holidays. 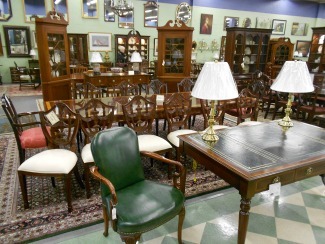 At Baltimore’s Favorite Furniture Consignment Store, everything is ready to for you to Take Home Today! Ethan Allen Home Office Furniture! This picture taken on our front row yesterday afternoon shows some wonderful Ethan Allen Home Office Furniture. The casual style will work great for people searching for a less formal look.Whether you Buy the Desk, a Bookcase, or the Entire Group, the value you get from buying on consignment will bring a smile to your face everyday. Visit our Timonium Store, Located Just One Mile from the Baltimore Beltway, to see these and other Office Furniture in our 9,000 Square Foot Store. If it’s a formal look you’re after, you’ll love the 72″ Sligh Executive Desk and Matching Credenza that just arrived yesterday. Inlaid Traditional Dining Room Furniture from Potthast Brothers of Baltimore Maryland! Now here’s some Fabulous Estate Furniture that you certainly don’t see every day! While many of our customers know and appreciate the quality of furniture makers like Henkel Harris, Stickley, Kittinger, and Statton, some still don’t know about the early cabinet shops like Biggs and Potthast that started it all. Pictured here are some of the Cabinet Made, Inlaid, Honduran Mahogany Dining Room pieces from Potthast that arrived on our dock yesterday. These fine pieces are older examples of Great 18th Century Reproductions from what was Baltimore’s Favorite Furniture Maker for Over 100 Years. Pieces include a set of 8 Shieldback Chairs with Bellflower Inlay, a Williamsburg Hepplewhite Sideboard, an Inlaid Server, China Cabinet, and a Double Pedestal Dining Table. Stop in today to see these beauties in person! 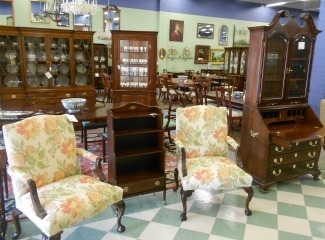 Wing Chairs, Martha Washington Chairs, Sofas and More on Consignment from Baltimore’s Nicest Homes! We set the same High Quality Standards for our consigned upholstery furniture as we do the solid wood pieces we bring into the store. Of course, many upholstered pieces get a lot more use than our case goods. That’s why this week at Cornerstone is especially nice for our customers searching for great deals on Traditional Sofas and Chairs! 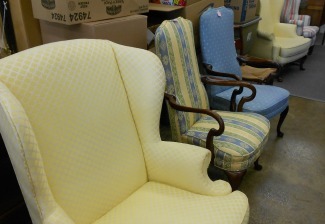 Pictured here are just some of the chairs arriving in our back room. Not photoed are two very nice sofas. All of this Fine Consignment Furniture is from local homes that we’ve personally visited to assure your satisfaction. So stop in today to be among the first of our customers to get a look. Kittinger, Statton, Hekman, Ethan Allen and More at Baltimore’s Favorite Furniture Consignment Store! Traditional Mahogany and Cherry Furniture from America’s Best Makers never goes out of style. We know that not every room in your home needs a formal look, but we also know that Buying Classic Forms of Furniture Will be an Investment You’re Sure to be Pleased with for Years to Come. So, while many new furniture stores have abandoned the classics, we’re going to continue to give Baltimore great value on furniture that will look stylish for years to come! Pictured just off of our dock this afternoon are Queen Anne Dining Room Chairs and a Banded Mahogany Pedestal Table from Kittinger. There’s also a Cylinder Roll Secretary Desk from Hekman and Bedroom pieces from Statton and Ethan Allen! The Light Maple Pieces from Ethan Allen are great examples of Traditional-Casual Furniture. Furniture made for a more casual life style, but with Timeless Beauty! See these and all our most recent additions by visiting the store this weekend and peeking behind the curtain to our backroom. Baltimore County Estate has All of Your Favorite Furniture Makers- Potthast, Baker, Councill Craftsmen, Maitland Smith and More! Another busy day at Baltimore’s Favorite Consignment Store as we bring in some Beautiful Inlaid Mahogany Furniture from a local estate! The photo taken near our dock yesterday shows the corner of a Banded Mahogany Dining Table from Councill Craftsmen. Also pictured are a set of 10 Chippendale Chairs from Maitland Smith and a Potthast Brothers Corner Cabinet! In the foreground is a Duncan Phyfe Sofa. And if you look closely, you can spot the top of an Inlaid Baker Breakfront hiding in the back. If you’ve been looking for A Large Breakfront that will “Make a Statement”, look no further. This 82 inch wide piece will make your party guests jaws drop! So hurry in today to see these and all the other Fine Traditional Furniture Pieces we’ve added to our store this week! 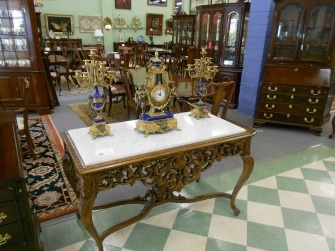 French Marble Top Console Table, Statton Cherry Dining Room, and More! Here’s a picture taken yesterday of our ever-changing front row. The Marble Top French Console is a great example on how you can put together a Timeless Traditional Design and still have a home with lots of style and flair! 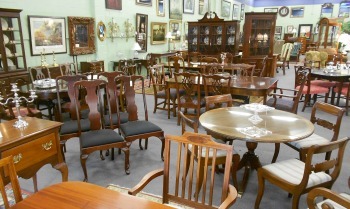 Pictured just behind the front row is an Oval Solid Cherry Dining Table with Six Queen Anne Chairs. Made by Statton Furniture, this set is sure to give it’s new owner years of use and pleasure. 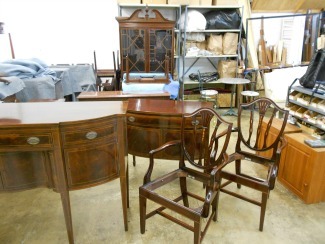 These are just a small amount of the wonderful Furniture that your Favorite Baltimore Consignment Store has scheduled to bring in this week. Stop in today to see it all! 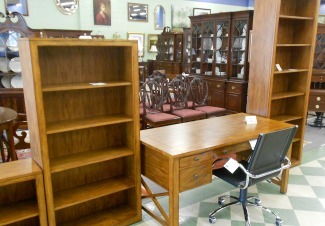 Traditional Mahogany Secretary, Nice Ball and Claw Upholstered Chairs and More! Here’s a picture taken just yesterday afternoon of some Beautiful Traditional Furniture just coming out to the showroom floor. The pair of occasional chairs are the nicest we’ve had in some time. And the price of just $650 on the Fabulous Secretary Desk is a good example of how we remain Baltimore’s Favorite Furniture Consignment Store year after year! If you want even more ways to save, LIKE US on Facebook. We’ll show our appreciation with special offers made exclusively for our followers! Join our Email Club, and you’ll get just 8 to 10 emails per year with more great deals. All of these Money Saving Promotions are just one more way we thank you for helping us stay the areas best store for High End Traditional Furniture.